The center piece of the top floor is a commercial, Tapan-Yaki steak house kitchen and nicer furniture and cabinets than I have in my own home. Before drafting the house, we blueprinted the fun for every activity and part of our think-tank process was considering where adults and children of each age group would congregate. Adults savor the top floor most often and teenagers congregate in the game room. We put plasma TV's and DVD players in 3 of the bedrooms so that parents can put cartoons on for toddlers. The first floor was designed for families with the youngest children in mind. Since they are usually the first to wake up and go to the game room theater, everyone else above them can still get some sleep. We also recognized how hard it can be to get kids to eat when they are having fun, so we put an extra kitchen on this level and a card table. Every conceivable thing that you will do here, we have done at other rentals and brainstormed about making it better. Ultra high-end electronics, 25 speakers, 5 plasma TV's, 16' motorized, drop-down TV/movie/PLAYSTATION III screen in living room and a 12' screen in the game room theater WITH X- BOX 360, 3 Jacuzzis, bubble hockey, pool table, gold flake granite counters, kitchen island with 4' wide Tapan-Yaki griddle, just like in a Japanese steak house! The outside deck and sunken-in living room are both down a step from each other and two steps from the kitchen to maximize the view of the great outdoors and create inclined movie theater-style seating for watching games, movies and TV on the giant 16-foot screen. We also had custom glass deck railings made so that no matter where you stand or sit, you enjoy a spectacular, unobstructed view from the top floor of the skiers and deer outside. On the inside we designed a custom 16-foot long leather couch, paired it with four ottomans that fit under a coffee table, and layed out the kitchen so that it forms a second and third elevated row of theater seating and becomes a part of the living room at game time. The leather barrel chairs at the lower island turn to face the screen and people sitting on the bar stools at the upper island see over everyone. The unique 4' COMMERCIAL griddle in the island, integrated 42" plasma TV/computer and Disney- designed lighting are obvious innovations, but the cabinets and hardwood floors and trim take the term "CUSTOM" to a whole new level. Our designer started by selecting grain-matched maple and mahogany planks. Those were then milled, stained and cleaned in a dust-free spray booth to our specifications and latter became the perfectly matched hardwood floors, doors and trim in the house. If you run your finger over the finish, it is as silky smooth as waxed show car. 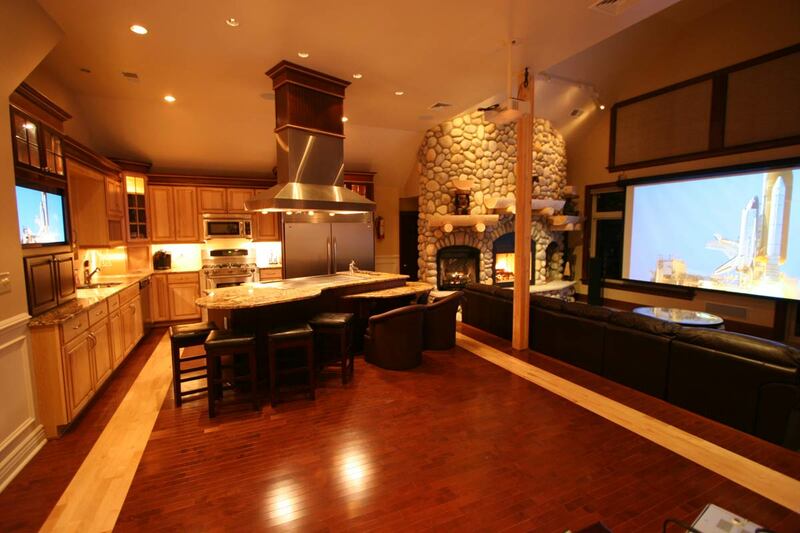 Imagine entertaining guests around the kitchen island while you gaze out onto the ski slopes watching the night skiers or the deer walk by. At game time, you press a button and an 16 foot TV screen descends over the windows. Better yet, why not sit in the 8 person hot-tub with a frozen drink and enjoy the view from the top floor deck? This house is designed to provide you with every luxury you can imagine while you take in the beauty of the outdoors. Whether it is summer, autumn or spring, this home provides a beautiful setting with plenty to do in the home and surrounding community. In the winter, guests enjoy a very exclusive, semi-private skiing experience, without the dangerous crowds on the slopes and long lift lines that you find elsewhere. With the 4 rechargeable 2-way radios that come with the house, you can let the children ski in and out (day and night) and keep in touch with them as they drift across the living room windows on the chair lift.